Please click the picture to look inside the book. 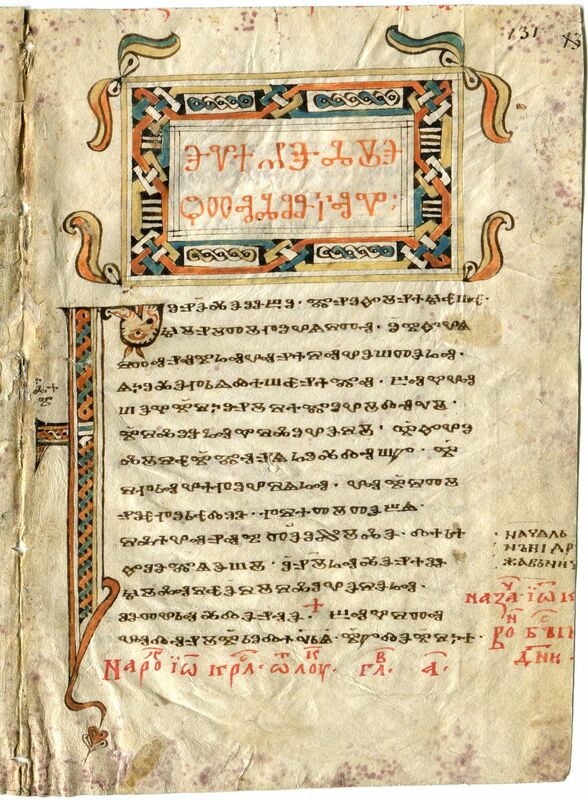 Codex Assemanius is a rounded Glagolitic Old Church Slavonic canon evangeliary consisting of 158 illuminated parchment folios, dated to early 11th century. The manuscript is of Macedonian provenience of the First Bulgarian Empire. The Codex is named after its discoverer, Italian Maronite scholar and Vatican librarian of Syrian origin Giuseppe Simone Assemani, who discovered it and bought it in Jerusalem in 1736. His nephew Stefano Evodio donated it to the Vatican Library, where the codex is still kept today (as Codex Vaticanus Slavicus 3 Glagoliticus). By content it is an Aprakos (weekly, service) Gospel. It contains only pericopes, i.e. parts read in the church. At the end of the manuscript there is a Menologium which mentions Sts. Demetrius, Theodosius, Clement (and other Saints). The codex is held by many to be the most beautiful Old Church Slavonic book. The first person to write about the codex was Mateo Karaman in his work Identitá della lingua letterale slava (manuscript, Zadar 1746). The manuscript was published by Franjo Rački (Zagreb 1865, Glagolitic), Ivan Črnčić (Assemanovo izborno evangjelje; Rome 1878, published privately, transcribed in Latin), Josef Vajs and Josef Kurz (Evangeliář Assemanův, Kodex vatikánský 3. slovanský, 2. vols, Prague 1929, ČSAV, phototypical edition) – republished by Josef Kurz in 1966 in Cyrillic transcription. The newest Bulgarian edition is by Vera Ivanova-Mavrodinova and Aksinia Džurova from 1981 (Asemanievo evangelie; Sofia: Nauka i izkustvo), with facsimile reproductions. The manuscript abounds with ligatures. Linguistic analysis has shown that the manuscript is characterized by frequent vocalizations of yers (ъ > o, ь > e), occasional loss of epenthesis, and ь is frequently replaced with hard ъ, esp. after r. These are the traits pointing to the Macedonian area, and are shared with Codex Marianus. Yers are also frequently omitted word-finally, and occasionally non-etymologically mixed (ь being written after k and g). The Psalterium Sinaiticum is a 209-folio Glagolitic Old Church Slavonic canon manuscript, the earliest Slavic psalter, dated to the 11th century. The manuscript was found in Saint Catherine’s Monastery in Egypt, after which it was named and where it remains to this day. The major part of the psalter (177 folios) was discovered in 1850 by the Russian archimandrite Porphyrius Uspensky, and additional 32 folios turned up in 1968. It was published by L. Geitler (Psalterium. Glagolski spomenik manastria Siani brda; Zagreb 1883), S.N. Severjanov (Sinajskaja psaltyr’. Glagoličeskij pamjatnik XI veka. Prigotovil k pečati Sergej Sever’janov; Saint Petersburg 1922, transcribed to Cyrillic; reprinted in Graz in 1954) and by Moshe Altbauer in 1971, in a facsimile reproduction (Sinajski psaltir, glagolski rakopis od XI. vek od manastirot Sv. Katerina na Sinaj, MANU, Skopje 1971). The manuscript is also extensively discussed with facsimile reproductions in Ioannis C. Tarnanidis: The Slavonic Manuscripts Discovered in 1975 at. St. Catherine’s Monastery on Mount Sinai (Thessaloniki 1988). Paleographic and linguistic analysis shows that the writing of some letters is very inconsistent. Especially inconsistent is the writing of yers and nasal vowels, and very obvious is the tendency of the vocalization of jers and the omission of epenthetic l.
The Codex Zographensis (or Tetra­evangelium Zographense; scholarly abbreviation Zo) is an illuminated Old Church Slavonic canon manuscript. It is composed of 304 parchment folios; the first 288 are written in Glagolitic containing Gospels, and the rest written in Cyrillic containing a 13th-century synaxarium. It is dated at late 10th or early 11th century. The manuscript contains 304 parchment folios. The first few ones have not been preserved, and thus it begins with Matthew 3:11 and ends with John, with Mt 16:20-24:20 being later insertion in old Macedonian Church Slavonic. In total, the first 288 folios are written in Glagolitic and contain Gospel text. In addition, several additional folios from the middle of the manuscript are missing. At the end of the 11th or beginning of the 12th century some missing folios (from 41 to 57) were replaced with 17 new ones, written in square Glagolitic. They were themselves most likely a palimpsest. The rest of the 16 folios contain 13th-century synaxarium. Along with the slightly older Codex Marianus it is an important document for its use of the round Glagolitic script, the oldest recorded Slavic alphabet. It exhibits linguistic features characteristic of Western Bulgarian (Macedonian) recension. By analyzing the language of the codex it was established that the style and antiquity of the text is nonuniform, second part being more archaic than the first part. Some scholars explain this by gradual adaptation to the language of the source from which the manuscript originated. Generally, phonology of the language of Codex Zographensis is archaic – vocalizations of strong yers are rare, epenthetic l is preserved, though in most parts of the manuscript yers are being assimilated. It is a bit less archaic with respect to morphology and syntax, though the forms of definite declension of adjectives and older forms of participles are well-preserved (e.g. prošь, nošь and rarely prosivъ, nosivъ). The Glagolita Clozianus is a 14-folio Glagolitic Old Church Slavonic canon miscellany, written in the eleventh century. What remained of an originally very large codex, having probably 552 folios (1104 pages), are 14 folios containing five homilies. Two of the homilies are complete; one by John Chrysostom and one by Athanasius of Alexandria, and three of them are fragments, one by John Chrysostom, one by Epiphanius of Salamis and one that is usually attributed to Methodius. Four of those homilies are known from other Old Church Slavonic codices, the exception being the one usually attributed to St. Methodius, which is found only in Clo, and sometimes referred to as the Anonymous Homily. The codex was named after the Count Paris Cloz who owned it in the first half of the 19th century. Prior to that, up until the end of the 15th century, it was owned by the Croatian nobles of the House of Frankopan, who used the codex as a house relic (it was bound with silver and gold) in worship, believing St. Jerome to be the author. Count Cloz donated the codex to the City Museum in Trent, where the first 12 folios are being kept today. The remaining 2 folios, discovered by Slovene Slavist Franc Miklošič, are kept in the Ferdinandeum museum in Innsbruck. Linguists somewhat disagree when discussing the source of the text; some, arguing on the similarity of the rounded Glagolitic with Sinaitic codices (Psalterium Sinaiticum, Euchologium Sinaiticum), hold that the manuscript originated in Macedonia, and others that it was written in Croatia, justifying it with the change of ь to ъ behind palatal č, ž, št and žd, a trait commonly found in other Croatian Glagolitic mediaeval manuscripts. The reasonable conclusion that follows is that the manuscript was copied on the Croatian territory from the original written in Macedonia. Dating from the second half of the tenth century, the Kiev Missal is generally held to be the oldest Old Church Slavic manuscript with a coherent text. The manuscript is a seven-folio text in Glagolitic script that contains parts of a Roman-rite missal (Sacramentarium), a book of texts used by a priest during mass. Written in three different hands, it includes a reading from the Epistle to the Romans by the Apostle Paul (Chapter XIII, verses 11-14 and Chapter XIV, verses 1-4), a prayer to the Blessed Virgin from the Annunciation service, and various prayers from the mass. The missal is one of the oldest monuments of the ancient Slavic written language, and is of enormous esthetic and linguistic value to world culture. The manuscript was given to the Kyiv School of Theology in 1872 by Archimandrite Antonin Kapustin, the chief of the Russian Orthodox mission agency in Jerusalem and a former student at the school. Kapustin reportedly found the sheets at the Saint Catherine’s Monastery on Mt. Sinai. The cover of the manuscript contains the inscription of Father Antonin: “To the library of the Kyiv School of Theology. Jerusalem. 1872.” Most of the text of the missal is written in black, denoting the texts meant to be pronounced. Passages written in red are instructions to priest regarding the conduct of the mass. This manuscript fragment contains part of an explanation of an unknown gospel. It was at one time bound into a Glagolitic copy of the manuscript book Historia Scholastica by Peter Comestor. The text of the fragment was written in the angular Glagolitic script invented during the ninth century by Saints Cyril and Methodius to translate the Bible and other ecclesiastical works into the language of the Great Moravia region. Around 1633 the folio was used to fill the book binding of the Czech translation of Pastorale Lutheri (The pastoral of Luther) by Conrad Porta. It was discovered by Samuel Zoch (1882–1928) in the Kálmár family library in the town of Veľký Krtíš in southern Slovakia. Samuel Zoch’s brother, Ivan Branislav Zoch, gave the text to Professor Vatroslav Jagič (1838–1923), one of the founders of the field of Croatian linguistic studies. Jagič proved the authenticity of the parchment and hypothesized that it was brought to the historical territory of Slovakia by Czechs living in exile after the Battle of White Mountain (1620). In 1930, Professor František Ryšánek (1877–1969) announced that the manuscript dated back to the turn the 15th century and indicated the Emmaus Monastery in Prague (the monastery of Croatian Benedictines at Slovany) as the place of the origin. The Saint-Antonian Glagolitic Fragment is the name of a double-folio parchment, probably of Croatian provenance, i.e., from the territory of the southern Slavs, where the students of Saint Methodius (815‒85) took refuge after the fall of Great Moravia. Produced by an unknown scribe in the 15th century, it contains text written in two columns with black and red ink using square Glagolitic script. It was probably part of a liturgical book, perhaps a Glagolitic breviary. In the 17th century this goat parchment was used as part of a book binding. It was discovered in this form in the mid-20th century by historian of book culture and bibliographer Dr. Vševlad Jozef Gajdoš in the Franciscan monastery in Saint Anton (present day Báč, in southwestern Slovakia). Great Moravia was a Slavic kingdom established in the ninth century in territories comprising the present-day Slovak and Czech republics, part of southern Poland, and the western part of present-day Hungary. Rostislav (also seen as Rastislav), who ruled from 846 to 870, invited the Byzantine missionaries Cyril and Methodius to the kingdom to spread Christianity. The brothers introduced the Slavonic liturgy, based on their own translations from the Greek, and the Glagolitic script for writing Slavic languages. Great Moravia weakened and fell into disunion late in the century, following the death of Rostislav’s successor, his nephew Svatopluk (reigned 870–94), and finally was destroyed by a Magyar attack in around 906. These two fragments are among the oldest artifacts in the manuscript collections of the Slovak National Library. They are parchment folios, written on both sides, and are of Croatian provenance. It is believed that they came to the territory of Slovakia through the Franciscan friars or by the exchange of codices and printed books among Franciscan libraries or archives. They were discovered at the library of the former Franciscan monastery in Hlohovec in southwestern Slovakia in 1936. The folios contain parts of the Glagolitic service book from the end of the 13th century or early 14th century, and were preserved in the Italian book binding of a copy of Trattato dell’amore di Dio (Treatise on the love of God, Venice, 1642) by Saint Francis de Sales. Old Church Slavonic text is written in Croatian Glagolitic of the older type. The sheets contain the masses De communi apostolorum (Of the community of apostles) and De communi martyrum (Of the community of martyrs). Although there remain no autographs from the period of the Great Moravian Empire (circa 800−circa 900), it is likely that these texts derive from the ninth century, mediated by Glagolitic and Cyrillic transcripts from 11th century and later. The manuscript is decorated only by the scribal initials. Glagolitic refers to the alphabet invented during the ninth century by Saint Cyril and Saint Methodius to translate the Bible and other religious works into the Slavic language spoken in the region of the Great Moravian Empire.